Just for Laughs -- You know, I keep asking myself why do people, especially Haitians, spend so much time on sites like Facebook. 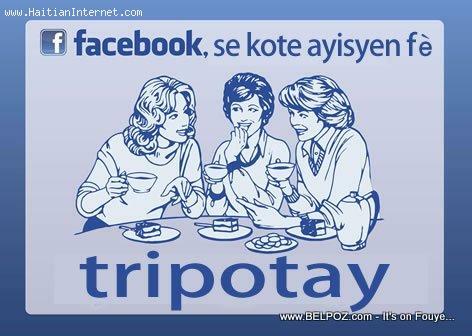 I think I know... TRIPOTAY... that's why! Question: Do you or someone you know spend ALL of their time on Facebook looking at nothing but photos and reading foolish things others have to say? Unless you happen to post a comment on the topic or photo you ace gossiping on , the world will never know. Yo gade yon foto, yon fe TRIPOTAY sou sa... Yo poste yon foto epi 25 jenn gason komanse di jan yo bel... epi, sa-w tande-a yon komanse: "O... O... Ou pa we kisa Jojo di? He Heyyyyy..."
In actuality we all in some way or form gossip, especially on fb, however, i personally mostly use fb for connecting with friends.